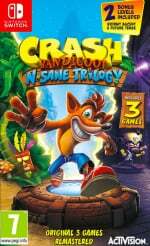 Crash Bandicoot N.Sane Trilogy is available now on Switch but has previously been released on Sony and Microsoft's consoles. If you're mulling a purchase and already own a PS4 or Xbox One system, you may well be wondering how the Switch version compares - and whether you should choose portability over performance. As we said in our review, Crash runs in 720p in docked mode. You've got a resolution drop to contend with right from the start as the other versions render at 1080p or better, but what about the frame rate? The guys at VG Tech have put the game through its paces on PS4, PS4 Pro, Xbox One, Xbox One X and Switch to see how it compares. While 30fps is the target on all formats, the Switch version drops more frames than its rivals - but it's not anywhere near as bad as it sounds, with Nintendo's hybrid console sticking to that 30fps goal surprisingly closely. In fact, were it not for the counter used in this video, you might not even notice the dropped frames. PS4 renders at a native resolution of 1920x1080. PS4 Pro renders at a native resolution of 2560x1440 and this is downsampled when outputting at 1080p. Switch in Docked Mode renders at a native resolution of 1280x720 and in Portable Mode renders at a native resolution of approximately 853x480. Xbox One renders at a native resolution of 1920x1080 and Xbox One X renders at a native resolution of 3840x2160. The UI is rendered at 3840x2160 on PS4 Pro and Xbox One X, 1920x1080 on PS4 and Xbox One, and 1280x720 on Switch in both Docked Mode and Portable mode. The Switch in portable mode appears to run better than in docked mode, though the game can still occasionally drop below 30fps in portable mode during both gameplay and cutscenes. Some differences between the Switch version and the other consoles versions are that it has removed fur effects, removed reflections, uses some lower quality textures, has reduced effects during some explosions and has a shorter draw distance. Reflections seem to render at the same resolution on PS4, PS4 Pro, Xbox One and Xbox One X. Let us know what you think of the port by posting a comment. Who need the PS4 version if we can play Crash Bandicoot on the go ? Honestly, it looks pretty bad compared to the PS4 Version. Gross even. I can't remember Cortex looking so gross. Especially the lighting is absolutely pitiful. And whatever they did to Tiny's and Polar's fur is unforgivable. So, a lower resolution than PS/MS for a collection of decade-old games that had an even lower resolution, but now on the go. Since I haven't played Crash since the first outing, I'm not bothered. Third party support, and all that. Yes, portable Crash. I played the originals, this version is better than them. Passed on the PS4 version last year since higher graphics didn't matter that much to me. Playing it and having fun. I could care less about digital fur. Not sure why I am here as I am not interested in Crash. Still nice to see devs are able to release a game with stable FPS on multiple supports. Enough with the endless comparisons! Is nobody else sick of this self-perpetuating cycle of 'let's see how it compares' guess what - IT DOESN'T LOOK AS GOOD BUT STILL LOOKS GREAT AND IT'S PORTABLE. Sorry, but I'd prefer to read articles about, y'know, stuff and not yet another comparison piece/video etc. The sooner people stop comparing systems and just enjoy them for what they are the better in my opinion. I believe that this game not looking better than it does on Switch is more because of the poor optimization work of the devs or just the lack of enough time before the release date, than the hardware itself. It still looks good enough though and no one is going to play it side by side with a PS4 or Xbox so it doesn’t matter much in the end... but still, with a little more effort and time, I’m sure the devs could’ve get a better looking game. Played it on the Playstation, just forgot about how precise you had to be with jumping etc. 720/30 docked and 480/30 portable? That's not impressive... either the developers need more talent or they don't care enough and believe "it will sell anyway". At a bare minimum it should run at 720/30 in portable mode, and if you want 1080p on the TV, play it on a "home console". Once again though, I do wish the WiiU would have survived a little longer so the Switch wouldn't have been rushed and would be just a bit more powerful to hit more modern resolution/frame-rate standards. 480p, going for that old-school feel I see! The Switch version looks ok from the video above, but it still should have been 720p 30 for portable mode, but even then I still wouldn't have purchased the Switch version since I already picked up the Ps4 version last year. @Octane Old School would be more like 240p... or 480i? Loved it first time around on the Switch looks great docked or not, if you don't have Xbox or PS4 u think it looks great which it does only wish they sort out the collision detection. @GoldenGamer88 Did you forget to put in a contact or something? @Octane Likely a matter of "looks good enough to sell and making it better would require a lot of work/time/money". Similar to what Zen did with Pinball FX... but luckily the fan feedback was enough to get it corrected the right way. The difference being that fans had the argument of "if this can look/run properly on mobile devices, surely you make it run right on Switch!" Look on the bright side, it's not a downgrade, it's a feature! Crash 3D Printed Edition, both grainy and plastic looking. Yeah, they skimped out on optimising. @Lordplops so you don't believe in helping consumers make informed choices about which version of a game they'd want to buy? When the Switch can't even run Crash Bandicoot at the same level/quality as everything else. It is really time to give up on the Hybrid nonsense. This game should run AT LEAST with 1080p/30fps on every console. DKCTF runs at 1080p/60fps and Donkey has a fur too.🧐 Seems like the game engine is kinda [removed]! And yet I'm playing it on the Switch in portable mode and having a blast while my PS4 copy is still shrink-wrapped. "Crash Bandicoot N.Sane Trilogy is available now on Switch but has previously been released on Sony and Microsoft's consoles." The game released on Switch and the Xbone at the same time, along with the PC version. I've been playing it since Friday and it's been all fun!! Guys are really saying things "no hair/fur, no play"? Ah, come on. If you have it on other console, just don't buy it. Simple! Handheld for me is the way to go. But man, I'd forgotten how some stages were hard and the number of times I had to replay some of them to be able to pass. Such a nice feeling of reliving good gaming moments! It's a freaking PS1 game running on a machine more powerful than a PS3, with tiny closed in track maps with almost no draw distance in play, while Wolfenstein II runs at 900(dynamic)/30, What farm team without electricity or running water did Activision farm this rush job out to to hit a target or 480/30 with that spec? Though it does make one wonder what goes on inside Naughty Dog code.... at least early Naughty Dog. I donˋt know and I donˋt care.😉 Fact is, this game should have no problem running at full 4K on the PS4 Pro and XBO X and 1080p on all other consoles. @MrBlacky that statement is not based on "fact" or "observation"... The PsPro being 4K is as true as Switch being "Hybrid". DKTF runs at 1080p/60fps and there is also "a lot going on". Sorry, but Switch is a hybrid. Has every feature of a console and every feature of a handheld. Every feature of a handheld and every feature of a console. @GoldenGamer88 I hate when people say even Xbox or PS4 cant run games at 1080p 60fps and then you see direct comparisons like this.. Great if you like the hybrid nature of the switch but for me who uses it 90% docked and it costs the same as a ps4 or xbox i feel ripped off. It'll be the xbox one x version for glorious 4K on my TV screen and the Switch version on the go. Hi, it's your banker ! Sold my PS4 copy of this to get a Switch version. I played through it already on PS4 but I just prefer playing games on Switch at this point. That said, I have noticed a difference. The colors look kind of drab in this version and the game is not as bright as on PS4. I don’t regret changing though cause i’d rather play this on the go. If you donˋt know what a home console is, just say so! Nothing wrong with that. Don't get the issues here, it looks good on the switch, ok Crash lacks the fur, but this makes it look more the actual Crash CGI models then trying to make him look realistic. Pretty good version. Not the kind of game where 4K really matters. As usual, the PC version looks the best for the frame rate but not much between the less powerful Consoles. @GoldenGamer88 ... It looks great man. I've played it both docked and undocked (and on ps4 as well) and it's the same experience. Looks the same, plays the same. @HugoStiglitz_420 Actually it is. Looks pretty much the same. I've got it on both ps4 and Switch and unless I'm taking pictures, uploading them and analyzing them with great vigor there's pretty much no difference. Sounds good to me, most people can't even tell the difference between 1080p and 720p past 3 feet anyways. It's embarrassing this can't hit 1080p 60 fps on any platform. That's very poor optimization. Also, 480p in handheld mode? Yeah, this port is rushed. Hopefully with decent sales of this title on Switch, Activision will see fit to update it to 1080p and then confirm a future release for Spyro! Heh, that's funny because I would feel ripped off since the PS4 and Xbox One can't be played on the go. I don't own either of those consoles so that's irrelevant anyway. Each to their own though. It's a solid game but the collection really looks blurry in the simple levels. @milliag Well, seeing as how the base xbox one and ps4 run this at 1080/30 and are several times more powerful than the Switch, the chances of that are slim to none..
@MrBlacky You mean...the 2.5D sidescroller? @UKRsoldier ah i stand corrected then, i thought i recalled reading it has 900 docked. That really doesn't excuse a ps1 game running 480/30 with such shallow environments. Not just switch. The performance on all platforms is abysmal relative to power. Activision must have gone with the cheapest, fastest port possible, which is sad given how popular it is and how they will show good profits for minimal quality. This game is poorly optimized on PS4 too. It’s no surprise honestly. Activision are lazy. You know the developers are incompetent when even tropical freeze is capable of simulating fur, why can't they figure out alternative coding rather than removing it outright? @Indielink Ah yes, my bad, I'm not wearing my glasses whilst at home. Do note please that the graphical downgrades do not mean it's a bad game. Portable Crash is awesome, no doubt about it. But at home, I'd vastly prefer the PS4 version. Yeah, I went with the 4k/60fps pc version instead. My Switch mostly stays docked to my extra monitor next to my pc, so buying inferior versions is a no go for me. @GoldenGamer88 I agree that the other versions look better but I think to say they look vastly so is a gross overstatement. If you're talking about DKCTF, that game is still fully rendered in 3D. I can hardly tell the difference. @Blizzia That is simply false though. Digital Foundry has already pointed out there's a large amount of effects missing and they all play a big part in the visual make up of the game. To say they look the same, you're fooling yourself. I could see if you said Wolfenstein II looks the same because the Switch version pretty much only has lower resolution while everything else is left intact, but Crash looks nothing like it does on PS4. It looks more like a PS3 Jak and Daxter HD remaster than it does like the N Sane trilogy on PS4. @Anti-Matter You say that as if Crash wasn't already playable on the go for years with PSP, or since it came out on PS4 with any form of remote play. If you really cared about on the go, you wouldn't be pretending like this is the first time its possible because you would have already known about the other options. I have 1 Rule for Multi released / Ported games. If the games released on Mutiple consoles (Example: PS4, Xbox1 & Switch), i will Definetely choose Switch version Regardless the specs. If the games was Ported from PS4 / Xbox1, i will choose Switch version, will not buy the PS4 / Xbox1 version, unless if the games are really really interesting. Portability Does really Matter for me, but i will Always choose Nintendo side. First, I feel for the poor guy who had to put that video together, playing the game over and over and over ... I'll bet after a while, they all looked the same to him too. Sure, you can see the differences ... but really all that matters is that you like the game, you buy it for whatever system you want to play it on, and you enjoy yourself. If visual fidelity turns you on, grab your RealDoll and have at it! If portability turns you on, take that Joycon and enjoy its sweet, sweet, HD rumble. If you like it, buy it, play it, and be happy. Yeesh. @HugoStiglitz_420 Now that's where I'll have to put my foot down. Digital Foundry themselves state that all the effects, while (mostly) present, are downgraded on Wolfenstein... And honestly, I've got Crash on both ps4 and switch, and I've played it on both. Unless you're on a huge TV screen you're not going to notice anything. The visual make-up is very, VERY similar. Personally I go max 32" because anything above that looks way too huge and detracts from the experience and my immersion in titles where that plays a part. Again, I always judge based on how it looks when played, not when you grab two stills and zoom in on things. Because sure, it matters for technical purposes, but not in practice (aka when you're playing). @Anti-Matter I can totally understand that as someone who waited to buy RE Revelations 2 on the Vita rather than PS4. It does depend on the game though but sometimes portability makes a giant difference. Having the best version of a game sometimes matters to me too (the main reason I have a PS4 Pro) so that's why sometimes I buy games on PS4 or PC and Switch. It's actually a dilemma I have with Doom Eternal. I'm having a hard time picking what version to get. I do have a PC that's good enough to run Doom on ultra settings, which looks A LOT better than even the PS4 Pro version, and I do have a nice 4k TV, but I also know I'm going to be REALLY tempted with the Switch version to do replays of Eternal while on the go. First world problems eh? @Blizzia Well of course viewing distance does matter. I had a 32" TV for a long time and recently switched to a 50". Frankly, for 1080p, 32" may be fine but for 4k it's not because it's sort of a waste of money at that point. Pixel density is already really high even on a 4k 50" but at 32", you'd have to be sitting 3 feet away to really see any benefit, and eitherway it still would never be as pronounced. Now if you're playing 1080p or below games, it doesn't really matter, but I play a mix of stuff so I do really prefer the 50". It did take about a week to really get used to. At first I thought it might be too big but it's actually perfect for where I sit. @HugoStiglitz_420 Might just be because I'm used to smaller monitors, but still, when it gets up above those 32" it starts to feel almost oppressive and it gets really hard to see what goes on everywhere on the screen at all times. Might just be me haha. EDIT: And yeah view distance does matter, of course. I just don't feel like I have a comfy view distance anywhere on those huge TVs/monitors.